Tim Stimpson began writing whilst studying English and Drama at the University of Birmingham. He went on to complete the MPhil in Playwriting Studies under the tutelage of April De Angelis and shortly afterwards joined the writing team for The Archers. At the age of 23 he was the youngest ever writer on the Radio 4 institution. Tim’s theatre work includes Skyscraping at the Soho Theatre and Southwark Playhouse, One, Nineteen at the Arcola Theatre, First Impressions at Margate Theatre Royal and was co-artistic director of Net Curtains Theatre Company. 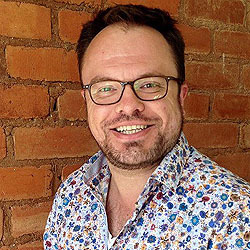 He is a member of Bold Text Playwrights, a West Midlands-based collective of professional writers who regularly present their work at the Birmingham Repertory Theatre.